Nicole Miller is a popular brand in the fashion industry. Whether it be Angelina Jolie or Blake Lively, various celebrities have worn the accessories and outfits made by the brand. Nicole Miller, the designer behind the company, is known for using her French heritage to provide users with quality accessories and outfits along with an array of other products. One department of the company actually produces luggage and it will impress you. Actually, almost all of the Nicole Miller luggage reviews you will read online are positive. That, of course, does not mean the brand is flawless, but it is one of the better ones out there. Here we have collected the 5 best luggage offers from Nicolle Miller. It is hard to find bags that cater to your need for both a stylish accessory and a convenient space to pack your possessions in when going on a trip. 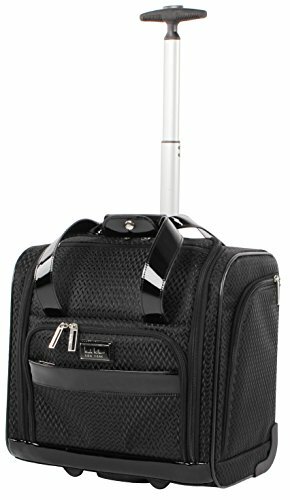 However, the Nicole Miller Expandable Spinner Bags have it all. This set consists of three suitcases and a carry-on bag. Each of these items is marked by a stylish exterior and an aesthetically pleasing color combination of blue and brown. Therefore, you can rest assured knowing that the bags will get you the praise you deserve. Moreover, each suitcase, as well as the carry-on, is equipped with enough space to ensure that you don’t leave anything behind. Normally, small suitcases are not great at offering such space, but even the smallest size included in this set has been constructed in a way to maximize the space that can be obtained from it. All suitcases come with wheels to allow for effective transportability. The tweed fabric used is easy to clean. All the products are expandable in nature. The carry-on has dimensions of 14 x 22 x 13 inches and can be expanded to 20.5 x 14 x 10 inches. We found that the quality of the zipper was sub-par. Once Nicole Miller improves this flaw, there is pretty much nothing else there is to complain about. For more luggage sets – read here. Some of us wish to stand out from the crowd and want our accessories to reflect our personality. For all the fun-loving souls out there, you will find this Rainbow Hard-Sided 3-piece set to be a worthy investment. The best feature of this product is its eight-wheel spinner system. Normally, luggage bags tend to have a maximum of four wheels. While such bags also manage to provide satisfactory performance, they cannot be compared to eight-wheel luggage bags. This is because the latter can take maneuverability and control of the product to a whole new level. Additionally, the suitcases are equipped with telescopic handles. These handles are manufactured to ensure a comfortable grip. Hence, Nicole Miller plays its part in making sure that its customers have all the tools for a long journey. The interior parts of the luggage set are fully lined. The wheels can spin in a 360-degree angle. The weight of the luggage items is light. The exterior features a funky rainbow design and is made of a hard material to ensure durability. The three sizes included are 28, 24, and 20 inches. While the design of the product is great, we don’t think that the color of the bags is practical to travel with since the light colors are prone to scuff marks. For those of you who don’t mind cleaning your suitcases now and then, this Hard-Side luggage delivers it all. Taking a huge bag along with you when traveling isn’t always the most convenient option. For short trips, you might need a smaller bag than an average 20-inch suitcase. One such option provided by Nicole Miller is its New York Kristina Collection bag. This luggage bag can serve as both a carry-on and a suitcase. It all boils down to how you wish to use it. This versatility of use has been appreciated by much as evident in Nicole Miller luggage reviews online. This is because the fact that you can both carry the bag via a strap or use the handle makes this product usable for various purposes. Moreover, you can easily fit it under your seat. This feature is guaranteed by the compact dimensions of the product. Yet, the luggage bag succeeds in being as spacious as possible. Both these features combined make this bag convenient to travel with. The material used in the construction is poly of high density. The interior of the bag is fully lined to ensure the security of your possessions. The weight of the bag is 5.2 pounds. The dimensions of the bag are 15 x 14 x 8 inches. This is a stylish bag that easily fits under the seat of a plane. It is well-made and has components that are durable. What else could one want? Those of you who are on the lookout for aesthetics, quality, and convenience will appreciate this product. 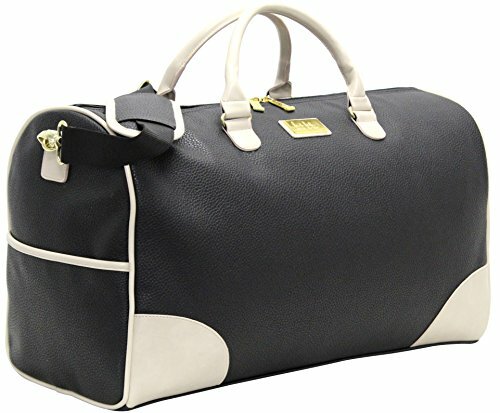 The Sharon City Duffel Bag is made for trendy individuals who wish to carry their luggage with style. At the same time, this bag is comfortable enough for you to use for extended periods. Nicole Miller is a brand for fashionistas, and this product proves it. The bag has been developed keeping in mind the requirement of elegant and stylish bags that persist in the female market niche. The company has been able to achieve this combination with the help of various features. Such characteristics include pebble-grain exterior, the presence of a small shiny gold hardware in the front and an animal print lining. Together, these elements work to reflect an aura of sophistication. The product is equipped with loop handles. The shoulder straps can be detached if you don’t wish to use them and can also be adjusted to whichever length you prefer. The dimensions of the product are 21 x 10 x 12 inches. The bag is available in four colors. We found this bag to be pleasing to the eye as well as functional. However, the quality of the zipper can be improved. Apart from this flaw, this duffle bag is a force to be reckoned with. Simple yet stylish, the Nicole Miller Jardin 4-piece luggage set has been successful in achieving the perfect combination that every woman craves for. This four-piece set includes a small spinner suitcase, two large spinner suitcases and a tote bag which can be viewed as a carry-on. By including such varying sizes in its offer, the Jardin luggage range has been able to provide a holistic package which prepares you for short and long trips alike. The inclusion of the 360-degree wheel system in the large suitcases guarantees that customers will be left satisfied. This is because such ease in maneuverability makes these bags practical and functional to use, which are two of the most crucial characteristics of a bag. The 20-inch spinner suitcase can be used both as a carry-on and a cabin luggage. The larger suitcases have sizes of 24 and 28 inches. The tote bag is accompanied by a removable strap or can be handheld. The cotton used in the construction of each product is high quality. You will find additional pockets in every bag along with complete lining. The telescopic push-button handle accompanies the suitcases included to allow users the ability to adjust the handle as per their height requirement. The only thing we were not a fan of in this product is the limited color choices. By limiting the options to black and grey, Nicole Miller has tried to play it on the safe side. However, when it comes to the functionality of the product, we were left impressed. Whether it be the roomy compartments or the quality handle, this product has it all. All of the products mentioned in this list have been successful in one way or another in providing quality and functionality. When conducting the Nicole Miller luggage review, we found ourselves tilting toward the Nicole Miller New York Kristina Collection 15″ Under Seat Bag. We understand that this bag might not be ideal for all traveling adventures. However, for short trips, this product might as well be the perfect companion. The fact that it is priced reasonably, is durable and is quite roomy for a 15-inch bag makes it an excellent choice. Regardless of which Nicole Miller luggage you end up selecting, rest assured you will be left satisfied. Nicole Miller gives you the unique opportunity of blending style with functionality. Make sure you make use of this advantage. Select your travel bag wisely. Remember, it will be your companion through it all. You may also find review of Tommy Bahama luggage interesting.